We are pleased to announce the 2019 Board of Directors Nominees*! Ballots will be sent via email to all eligible NBA members** in early November. Six successful candidates will be chosen from the list above. We urge all members to participate in selecting the future leadership of the NBA. Election results will be announced at the Annual Meeting & Banquet on Wednesday, December 5, at the Music City Center. The YLD nominates the following members to positions on the Executive Committee for 2018. Current YLD members are invited to vote on the Executive Committee positions at the YLD annual meeting on October 25 at 5:30pm at Hopsmith Tavern. Contested elections will be decided by secret ballot. To be elected, a candidate must win a majority of the votes cast for that office. Proxies are not allowed, and YLD members must be present at the Annual Meeting to participate. The YLD also has a number of appointed committee positions, focusing on social events, professional development, and public service. If you are interested in being appointed to a committee position, please contact Gulam Zade. Members of the NBA will be electing six new Directors to serve on the Board for a four-year term commencing January 1, 2019. If you are an active member of the NBA and are interested in being considered for Board service, please email Monica to submit your name no later than Friday, August 17. The election will take place in November, and all members whose 2019 membership dues are received no later than Wednesday, October 31, will be eligible to vote. It’s time to renew your membership! The 2018 membership year ends on October 31. You may renew online at NashvilleBar.org/Renew (it only takes a few minutes!) or email Vicki and she will assist you. If your firm is part of Firm Billing with the NBA, please check with your administrator before renewing online. Thank you for your continued support and membership—we appreciate you! Pursuant to the March 14, 2018 Order of the Tennessee Supreme Court, the Nashville Bar Association respectfully submits the following written comments to the Petition for the Adoption of Amended Tennessee Supreme Court Rule 31, Appendix A to Rule 31, and Supreme Court Rule 31A. The NBA responds to legislative initiative SB2511/HB2679, proposing to strip the 20th Judicial District of a judgeship in September 2020. 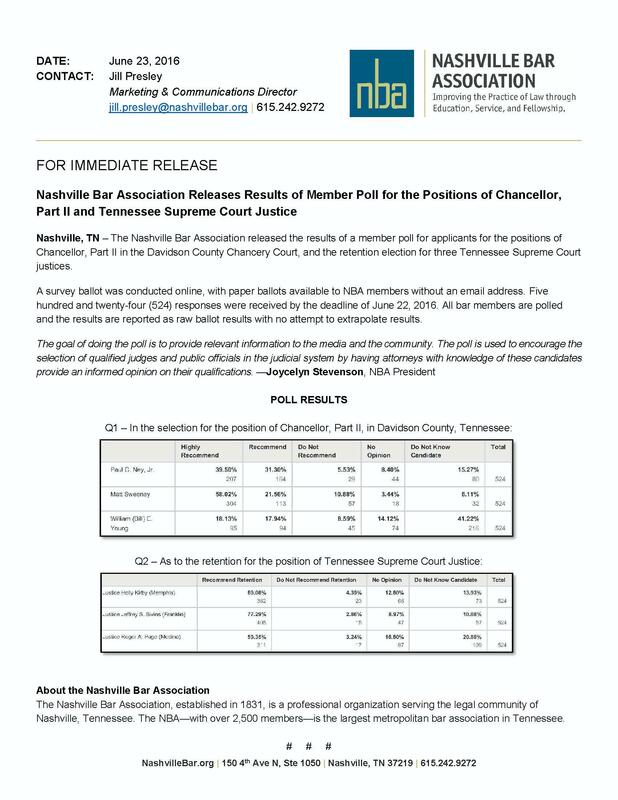 Notice is hereby given of the election of the Nashville Bar Association’s Delegate to the American Bar Association House of Delegates. The term of this position is two years from August 1, 2018 to the conclusion of the ABA Annual Meeting in August 2020. The Delegate will represent the NBA before the ABA House of Delegates, which typically meets during February and August of every year. The Delegate will be expected to report to the NBA on issues and policies coming before the ABA. This position will be filled by election by a majority of the NBA Board of Directors at its meeting on June 5. Eligibility has been determined by the NBA Board of Directors to be a member in good standing of the NBA, as well as the ABA, both at the time of election and throughout the term of office. The declaration must be received no later than Monday, May 1, and include a copy to Monica Mackie, NBA Executive Director. If you have any questions, please email Monica or call 615-242-9272. As a result of the resignation of Davidson County General Sessions Judge Angelita Blackshear Dalton upon her succession to the Davidson County Criminal Court, effective November 30, the Metropolitan Council is required to fill the vacancy until the next general election pursuant to Article 7, § 2 of the Tennessee Constitution. Notice of this vacancy was announced at the December 5 Metro Council meeting in accordance with the Council Rules of Procedure. Nominations may be made in writing, signed by the person making the nomination, and filed with the Metropolitan Clerk not later than 4:00pm on Tuesday, December 12. Nominations should include the nominee’s complete contact information. An election to fill the vacancy will be conducted at the Council meeting of January 2, 2018. Additional information will be sent once we have a final list of nominees, in order for your respective bar associations to conduct the Candidate Evaluation Poll. Congratulations to our six new board members for 2018! Thank you to everyone who participated in the election. We appreciate your membership and look forward to serving you in the new year! The YLD nominates the following members to positions on the Executive Committee for 2018. Current YLD members are invited to vote on the Executive Committee positions at the YLD annual meeting on October 26 at Fleet Street Pub in Printers Alley at 5:30pm. The YLD also has a number of appointed committee positions, focusing on social events, professional development, and public service. If you are interested in being appointed to a committee position, please contact Tera Rica Murdock. The Nashville Bar Association and the Nashville Bar Foundation are proud to partner with Habitat for Humanity of Greater Nashville this Fall in its second ever Habitat for Humanity build—the first build was 20 years ago. The family we will be helping, Ousmane Ndione and Khady Diop, is very excited about getting to build their house alongside our volunteers. We are in need of donations to cover one day of construction on their house and also volunteers—it’ll be up to us to provide the necessary people power to accomplish the build tasks on our day. Thank you in advance for your support! Hands On Nashville Day—the community’s largest annual day of service that brings volunteers together to support one of the city's most important resources: Metro Nashville Public Schools—is September 23. The NBA team will be assigned to a Metro Public School to coordinate and complete projects that enhance learning environments for local students. This year, projects will include painting, landscaping, creating paint-by-number-style murals, and more! To join the NBA team, contact Christen Blackburn. Is your “current” headshot over three years old? If so, it’s time to get a new one taken and we are here to help! Photography for the 2018 Attorney Directory is scheduled for the week of September 25–29 at the NBA offices. Contact RCL Portrait Design to book your FREE personal photography appointment now. For more details, click here. Members of the NBA will be electing six new Directors to serve on the Board for a four-year term commencing January 1, 2018. The Nominating Committee is meeting soon to discuss potential nominees. If you are an active member of the NBA and are interested in being considered for Board service, please email Monica Mackie or call 615-242-9272 to submit your name. All names must be submitted for consideration by August 18. The Board elections will take place in November, and all members whose 2018 membership dues are received no later than October 31 will be eligible to vote. The NBA is seeking the best and brightest young, diverse high school students for participation in their 2017 Summer Intern Program. Law firms, corporate legal departments, and government offices are asked to hire one or more students to serve as runners, filing clerks, or administrative assistants. Click here for more information and to download an application. In celebration of Law Day, join the Nashville Bar Association and keynote speaker Honorable Sheila Calloway on Friday, May 5, at the Downtown Renaissance Hotel. In addition, the Norman Award will be presented to Metro Public Defender Dawn Deaner and the Liberty Bell Award will be presented to Honorable Todd Campbell. For more information and to register online, visit NashvilleBar.org/LawDay. You may also register by downloading this form and returning it to the NBA offices no later than Friday, April 28. The NBA Young Lawyers Division will once again host the Davidson County High School Mock Trial Competition on Friday, February 24, and Saturday, February 25, at the Historic Metro Courthouse. Volunteers are what make this competition possible every year, and the students greatly appreciate your time and support. We look forward to seeing as many of you as possible for this event! Nominations are now being sought for the Jack Norman, Sr. Award that will be presented during the Nashville Bar Association’s Law Day Luncheon on Friday, May 5. This award is given to criminal law practitioners—including specifically defense attorneys, prosecuting attorneys, and judges of courts with criminal jurisdiction—who practice before or serve as judges of courts exercising criminal jurisdiction located in the Metropolitan Nashville area. The award may be given posthumously and is not necessarily presented every year, but only when a deserving individual is to be recognized. The Norman Award must be given to an attorney whose primary practice is in or service pertains to criminal law, demonstrates respect for the rights of all individuals in the criminal justice system, exhibits the trial advocacy skills or judicial skills necessary to the pursuit of justice, demonstrates an abiding respect for the law and legal profession, maintains highest standards of professional integrity and ethical conduct, and contributes to the improvement of the legal profession and criminal justice system—including but not limited to the provision of uncompensated or undercompensated representation of the accused. Nominations and supporting documentation for The Norman Award should be emailed to the NBA Criminal Law and Criminal Justice Committee Chairs, Daniel Satterfield and Grover Collins, no later than Friday, February 17th. Nominations are now being sought for the Liberty Bell Award, which will be presented during the NBA’s annual Law Day Luncheon on Friday, May 5, at the Renaissance Hotel in downtown Nashville. This award is given to the person or group—not necessarily attorneys or law related groups—who has promoted a better understanding of the rule of law, encouraged greater respect for law and the courts, stimulated a sense of civic responsibility, or contributed to good government. Nominations and supporting documentation should be submitted to the NBA Community Relations Committee via Traci Hollandsworth no later than Friday, February 17th. The NBA's annual Damali Booker 1L Minority Job Fair will be held on Saturday, January 28, at Waller Law Firm in Nashville. The event will kick off with a reception for all candidates and participating employers on Friday, January 27, at 5:30pm (also at Waller). 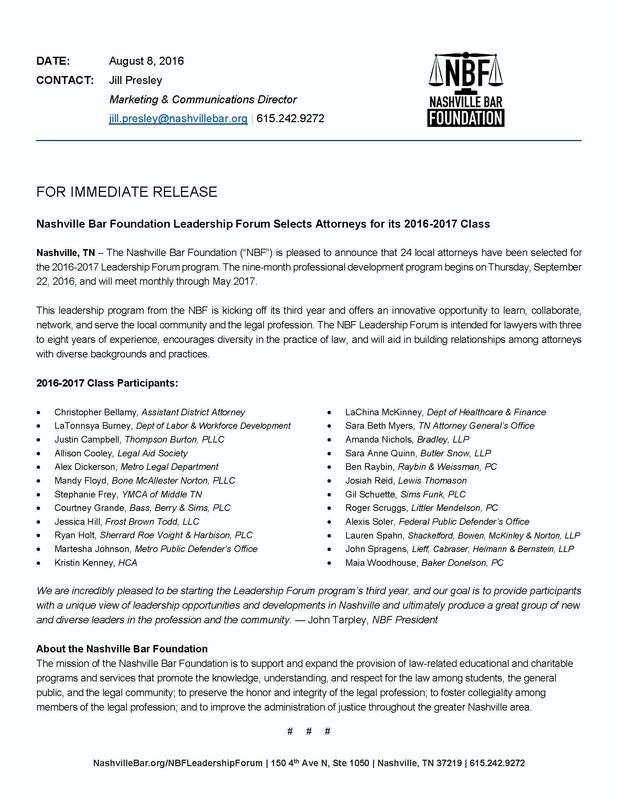 Visit NashvilleBar.org/DiversityCommittee to learn more about the opportunities that the committee provides for the local community. Thank you to the following law firms for sponsoring a Leadership Law Gift Table at the NBA Annual Meeting & Banquet! Welcome to ALL of our 144 new members who joined the NBA during the months of October and November. We look forward to serving you! Thank you to all of you who participated in the 2017 Board Election. We appreciate your membership. Let us know how we can serve you!